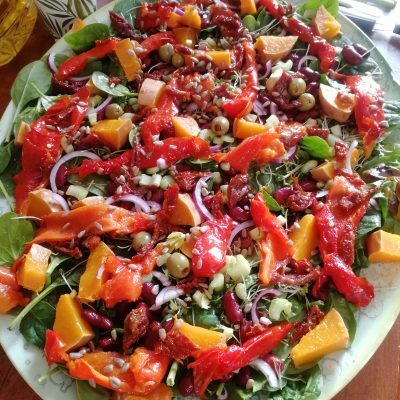 Elspeth Humm, one of our retreat chefs, made this on a recent yoga retreat and it went down a storm. Here is the recipe for a delicious salad that is filling, nutritious and packed full of the good stuff! Plate it up as we have done, or create small portions to have alongside a meal or as a light lunch. It’s colourful and versatile and sings of spring and sunny afternoons! Get a load of that goodness. Yum! Slice the butternut squash in half and place on a baking tray. Wash the red peppers and place on the tray whole, sprinkle with oil and salt and bake in the oven for approximately 25-30 minutes (until soft). Remove the peppers and place in a bowl then cover with cling film, the squash will probably need another 10 minutes, it is done when you can get a knife through it easily. Then remove from the oven and allow to cool. Wash your kidney beans and spinach, place in a bowl and add finely chopped sun-dried tomatoes, cut the olives in half and add these to the bowl, thinly slice your red onion into half moons and add too, along with a few handfuls of sunflower seeds. Remove the cling film from the red peppers and peel the skin off, then chop into chunks or strips and add to the bowl. Cut the squash into cubes and add too. Place 4tbsp of tahini, 4tbsp extra virgin olive oil, ½ tsp salt and pepper into a jug and stir, pour into the bowl and toss all the ingredients together. Spread a little more spinach as a base on a platter, then pour out the mix to serve!